A skateboard decor makes a great teen sports themed room. Do away with boring brown or white headboards. 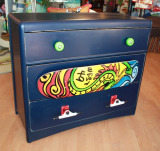 Bring some zing into the teen room with a skateboard bed and bedding. When deciding on the bedroom themes for a teen room, you must consider the teen interests. If a room is decorated in their favorite theme, they will be proud of it and more likely to keep it clean and organized. Skateboards have become so popular that you can't see one in the store without immediately associating it with teenagers. If your son or daughter enjoys this sport, why not bring it indoors and convert their teen room to a Skateboard Bedroom ? We have some neat (or should I say 'sick'?) skater bedroom ideas to offer. A plain brown or white headboard can become the focal point – Paint skateboards with different designs on the headboard and footboard. Painting not your strong point? You can stencil in a design. For a more personalized skateboard decor look, take a photo of your teenager on the skateboard, print on projector paper, project on the wall above his bed, outline and paint. It does take up more of your time, but the end result will also be worth the effort. Tip: Want a personalized look without the effort? Head on over to VisionBedding – they can customize your photo to create murals, beddings and more. Buy skateboards and use them as skateboard decor around the room. Take the wheels off and use the board as a headboard or on the wall as a shelf. Tip: If the expense goes beyond your budget, paint a couple of skateboards on the walls and put simple shelves in front. For more visual help, do an image search for 'skateboard shelves' and pick up the idea you would like to go with. Subscribe to our e-zine Kids Room Alerts to receive fabulous how-to ideas and special savings that you won't see on our site. Use the wheels as dresser or door knobs. Or you could even use the entire skateboard as shown in this picture. Get an old skateboard (if you don't have one, try the local yard sales or craigslist) and cut in half. Attach on the wall for a great 3D effect. Decorating the bedroom theme with your own projects is a fantastic way to personalize the room and also save on some heavy duty expenses. But we are not all quite so handy. And sometimes we just don't have the time either. You don't have to forego the skateboard decor theme for the room or feel guilty about not doing things yourself. There are many products readily available for you to pick up in stores or online. And we have done the homework for you. Check out below, our list of items to pick and choose the ones you need for your skateboard room. Now, that awesome teen room is just a click away. Teen Rooms – Need help getting started on the decorating project. We have the answers you need. Teen Furniture – Got your shopping list ready? We have some great furniture and bedding ideas. See them before you head out the door.